I have got to start taking pictures with something other than my phone. 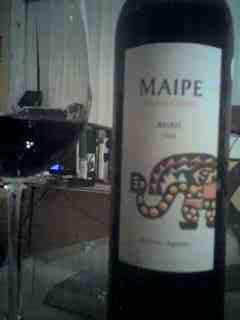 Tonight's entry into the blog is the Maipe Malbec 2008 from the Mendoza region of Argentina. For those of you who don't know it already, only four countries in the world produce more wine than Argentina and for the time being some of the best vino bang for the buck can be found here and in neighboring Chile. I picked up this wine for $8 from San Diego Wine Company and it's a real winner. Beautiful purple bleeding out to a red rim in the glass the wine visually shouts "body" and it does have it. Here we get a wonderful blend of blackberries, plums, "gaminess" and hints of spice greeting the noise while it delivers black fruits, pepper, smooth tannins and a fine acidity slowly tapering off into a lovely finish. Well worth it for twice the price (but don't tell anyone I said that). Hi, My name is Lindsay and I work with Cigarsdirect.com. I see you enjoy smoking cigars. Would you be interested in review some cigars for is in exchange to link to our site? Please email me to get more details if you are. Thank you. But Argentina puts out the most Malbec since it grows the grape the best. Fell upon your blog. Love the reviews!